La Fuga are proud to announce a superb new fleet of carbon Cervélo R5 bikes. Available in all sizes for rental, take the stress out of transporting your bike abroad, and transform your ride experience: Reserve yours here. La Fuga have carefully considered the Cervélo R5 spec to ensure our rental bikes provide the perfect steed to tackle any La Fuga cycling challenge, from cobbles to cols. The bikes look and feel great and give fantastic rides, all the reason to give your own bike a rest and take the opportunity to tackle your challenge on a brand new R5. 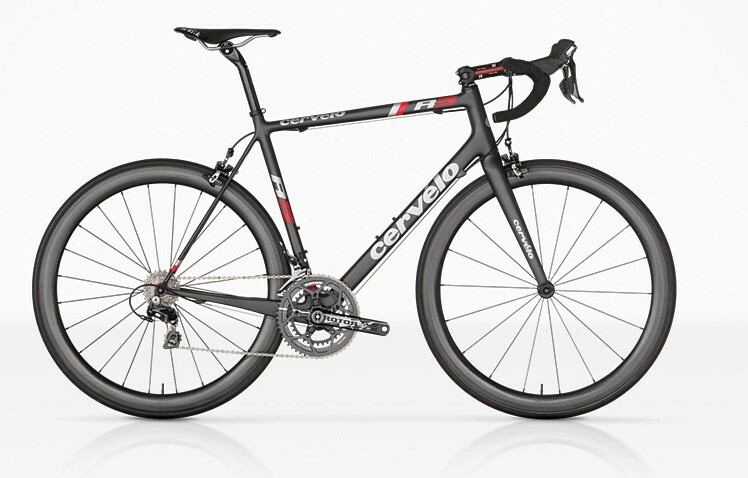 Cervélo has set the benchmark with a frame that features numerous carbon-optimization techniques discovered during Cervélo’s Project California. The bike also boasts top-level New SRAM Red 2013 groupsets, plus 3T Team bars & stem – a bike worthy of any World Tour team. Saddles are the comfortable Fizik Antares. See indidivdual tours for pricing. Please click here to book a La Fuga R5 Rental Bike for your 2013 tour. Full payment is required at the time of booking but will be refunded in full if cancellation is received more than 30 days before the start of the Rental Period. Full terms and conditions can be read here. With the racing season now underway (yes we know it’s still early February), everyone is looking forward to the Spring Classics, the first big races of the season. Will Fabian Cancellara be the marked man again? Will Thor Hushovd finally take a Spring Classic win? Can Tom Boonen reproduce his past form and become a Belgian hero once more or will Philippe Gilbert step up to become overlord of the cycling monuments? 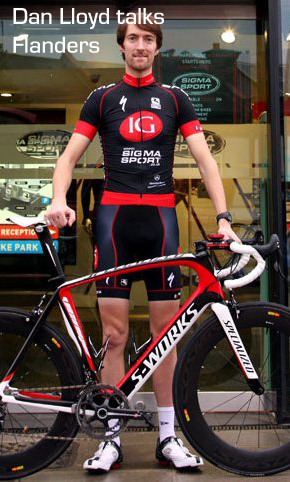 A good friend of La Fugas, Dan Lloyd, rode for three seasons with the Cervélo Test team, which then became Garmin-Cervélo. He competed in some of the biggest classics in the cycling world, riding with Thor Hushovd, Carlos Sastre and Heinrich Haussler. 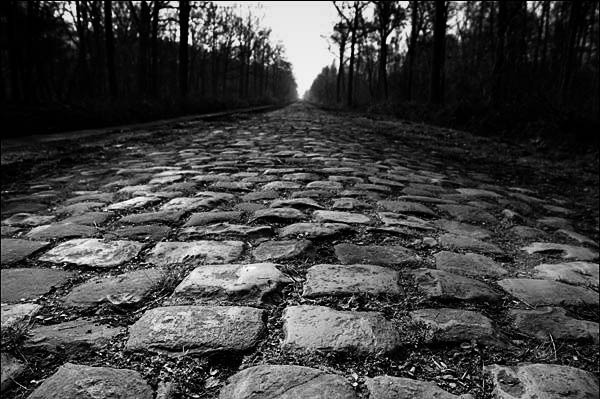 La Fuga are running an exciting tour to see one of the biggest cobbled Spring Classics, the Ronde Van Vlaanderen. You can ride the cobbles on the sportive event, be part of the fever-pitch atmosphere on the road side on race day and sample the delights of the array of Belgian beers and frites with mayonnaise. Here he talks to us about the Ronde Van Vlaanderen (Tour of Flanders), and more specifically the 2009 edition. A rider who had matured his racing career in the Flanders region of Belgium made it into the dangerous break of the day with riders such as Sylvain Chavanel, Leife Hoste and Manuel Quinziato, all known for their classics pedigree. 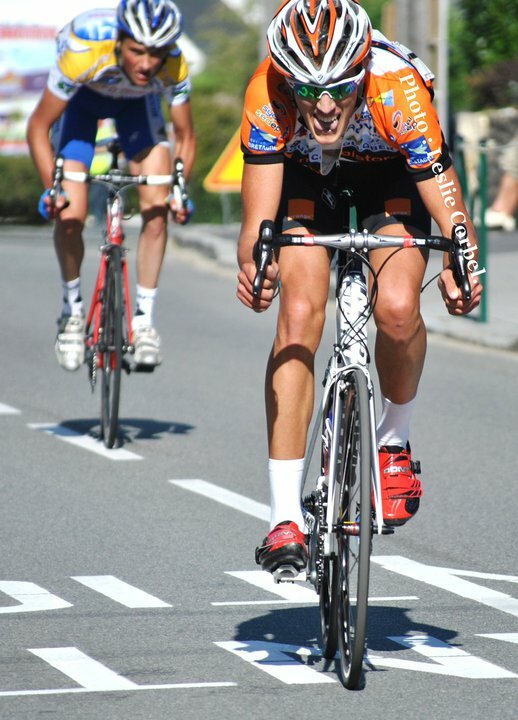 You can see here the difficulty as Dan and the rest of the days move hit the incredibly steep Koppenburg. Lloyd relives his experience with La Fuga and tells us why the Flanders bergs are so important to him and why he thinks you shouldn’t miss out on our Tour of Flanders weekend. LF: The Ronde Van Vlaanderen 2009, you made the vital break putting pressure on the other teams to chase. 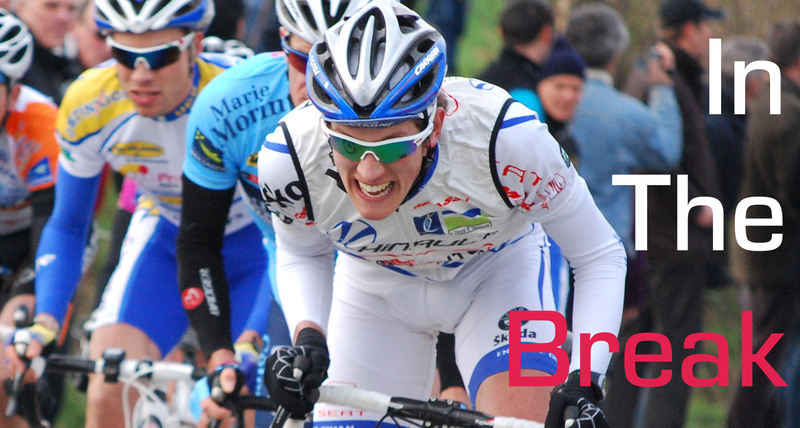 Tell us about this race that is very special to the people of the Flanders region of Belgium. DL: Flanders was THE race that I always wanted to do, ever since I started cycling, there was always something special about it and I always admired and looked up to the hard men that did well there. I had goose bumps all over from the moment I rode into the big square in Brugge to sign on, the atmosphere was electric, I had to pinch myself as it didn’t seem quite real that I was in amongst it. LF: How did the move come about? Who started the move and where? DL: It wasn’t really an ‘early’ move – I made the attack after the Paterberg which was at 180km, I was right up there mixing it with the big names and I was told to attack if I could. Leif Hoste, Sylvain Chavanel, Quinziato and a couple of others came with me, and we were away, racing towards the Kemmelberg. LF: What did it feel like to be in a break like that and what were the tactics being employed by the teams/riders? DL: I cannot begin to describe the feeling, just starting the race was a dream come true, so to be off the front with riders of that quality was incredible, and there was so much support from English fans on the side. Of course, that break wasn’t part of the final shake down, but for my team (Cervelo), Quick Step and Lotto, it meant that they didn’t have to force the chase from behind, which means that you can save a few riders until later. 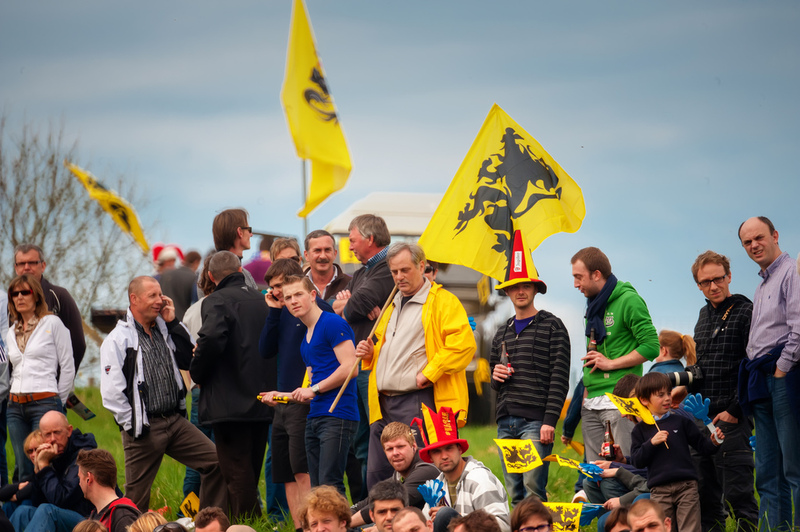 LF: What is the atmosphere like with the Flanders fans? DL: They are just so passionate about their cycling, and that is really their world championships. It’s not just the day itself, it’s the whole build up, the week before the race is a huge build up and the big riders are on the TV and front pages of the newspapers talking themselves up and others down! It just seems that everybody from Flanders is knowledgeable about the race, and most of them come out to support from the roadside. These days, there are so many more international spectators; I don’t think the event has ever been as big as it is now. LF: What do you remember most from that day? DL: Being in the break is obviously always going to be the standout memory – I ran out of legs towards the end when Chavanel attacked before the Muur, but I was still able to help my team mates a little and in the end Haussler came 2nd, which, considering how dominating Devolder was that day, was about the best we could have done. LF: Which is the toughest climb on the route? DL: The Kemmelberg is the one that everyone fears, it’s a dead stop into it at the bottom and notoriously steep, often even the pro’s have to get off and walk. The Muur is the final big one and often where the action happens, it’s not that hard if you go into it fresh, but after 230km it really hurts. LF: They’ve changed the route this year slightly, what do you think of this? DL:The parcours looks harder to me, the final does laps up the Oude Kwaremont and Paterberg, both very hard cobbled climbs. I think it is really favouring Gilbert, and he will be as motivated as ever to win his home race. I hope the fact that the end is harder won’t make the racing more negative – it’s sure to be a race of attrition anyway, particularly if the weather is bad. LF:Where do you think the race will be won and lost this year? DL: Those final laps will decide things, whoever has the legs will come to the fore at that point. LF: As someone that’s lived in Belgium, what things shouldn’t people miss on out during a visit to the Flanders region? DL: The local bars and choice of Belgian beers shouldn’t be missed; it’s a real part of the culture over there. Of course there are the Frituurs as well (chip shops), and the Tour of Flanders museum in Oudenaarde, but the main experience is the race and the chance to ride over the same roads yourself, get an experience for the cobbled climbs so that you can appreciate how hard it is. LF: Talk to us about this year with IG Markets – Sigma Sport riding on Specialized S-Works SL4 Framesets; will you have a full racing program and what are your goals for the season? DL: My racing program won’t be quite as full on as it has been the last few years, but the quality of the racing in the UK is getting better every year. My main goals will be the National Championships and the Tour of Britain, both important races for myself and the team. Thanks a lot to Dan for taking the time to answer our questions and we’re all looking forwards to seeing him make his mark on the British domestic racing scene as well as abroad. If you’d like to ride the same roads as Dan Lloyd and the pro peloton during the Tour of Flanders, sign up for our Tour of Flanders weekend. The weekend will feature riding the sportive event on the Saturday before recuperating with some beer beers and frites. 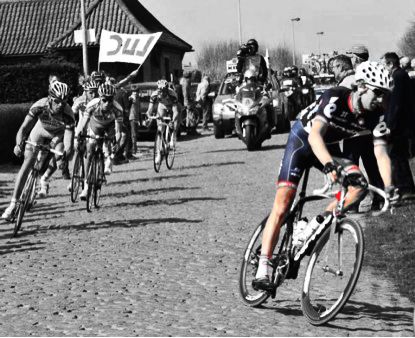 On Sunday we’ll head out to see how its really done when the pro’s battle it out to become the ‘Lion of Flanders‘. Every year in early April, the pro peloton prepares its bikes for the toughest tests of the season, the cobbled classics. The Ronde Van Vlaanderen, Ghent-Wevelgem and Paris-Roubaix make the big spring classics across Northern France and Belgium incorporating some of the roughest sections of cobblestone roads that anyone would dare to organize a road race over. The Kemmelberg, the Koppenberg and Le Carrefour de l’Arbre, are all sections of road that strike fear into both riders and mechanics alike. For generations, the frame and wheel builders of the cycling world have searched for the most effective and strongest way to tackle the stretches of Pavé used year after year. All kinds of unorthodox methods have been employed with varying degrees of success. 1994 perhaps saw the most extreme methods being implemented. Andrei Tchmil rode a Rock Shox Paris Roubaix SL to victory, using a short travel front suspension fork. 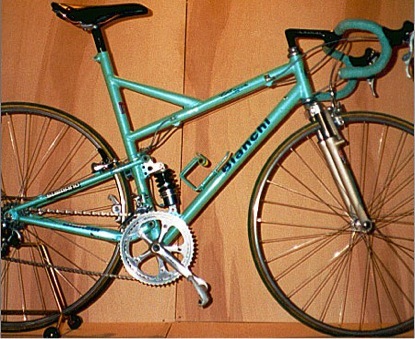 The same year Johan Museeuw, the Lion of Flanders and 3-time winner of both Roubaix and Flanders, used a dual suspension road bike built for him by Bianchi. He eventually threw his bike into a ditch although his frustration was mainly due to his pedals, which, like the rest of his bike, were completely clogged with French farmland. Many teams have used and still use, cyclo-cross bikes due to the larger clearance to let any unsavoury mud pass through the gaps. But breakages happen. The most recent memory was of Classics Specialist George Hincapie in a heap on the floor suffering from a separated shoulder after the steerer tube of his fork failed during the 2006 edition of Paris-Roubaix. As his handlebars come away from the frame with no way of steering the bike he veers off the road, at some speed, and somersaults over the front. 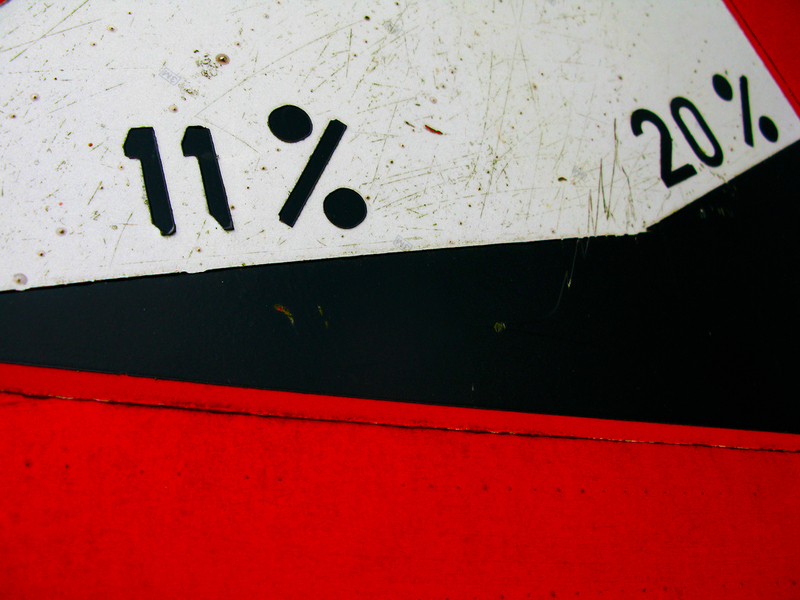 But the component(s) that takes perhaps the biggest battering are the wheels. Many methods have been tried and tested, teams these days even use carbon rims and tubeless tyres as technology advances and materials are developed. Cancellara took Flanders and Roubaix on carbon rims, as did Johan Van Summeren last year during the Queen of the Classics into the velodrome at Roubaix. But there is one combination that has been tried and tested over and over again and is the preferred choice of Cobbles newbies and veterans alike. That being the Ambrosio Nemesis Box tubular. Here at the La Fuga office we heard a very nice pair were being built up by George the mechanic in the Sigma Sport workshop. We felt compelled to go and check them out and we weren’t disappointed. This pair were using Ambrosio’s most recent incarnation of the Nemesis rim, which is the same as its been for many years. Why? Because it works. The rim is used by a large percentage of the pro peloton during the cobbled classics. Even when teams have deals with wheel manufacturers, they often re-sticker the Ambrosio’s in order to keep their sponsors happy. But you can always tell an Ambrosio rim by the classic brass valve balance that adds a touch of class to the wheel. The nemesis rim bears the words La Reine du Nord rightly giving it the title of the Queen of the Northern classics. The hubs used on this particular build are DT Swiss 190 ceramic bearing, offering the best in new technology to spin the classic hoop. DT Swiss also provide the double butted spokes with two thick ends, providing strength at the ends and flexibility towards the middle, this ensures snapping stays to a minimum. 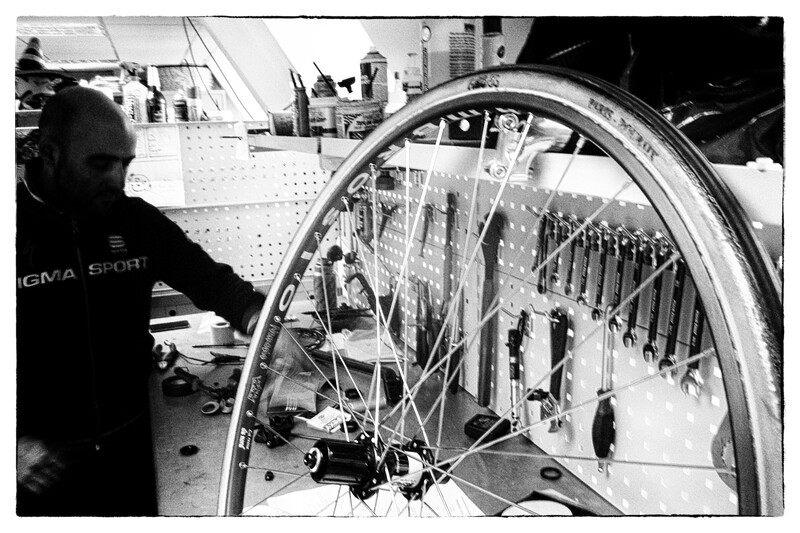 George the mechanic built the wheel using 3 cross lacing to ensure the perfect mix of suppleness vs toughness. Finally, the thing that really rounds these wheels off perfectly (pun unintentional) are the FMB Paris-Roubaix tubular tires. FMB (or François-Marie: Boyaux) have been hand stitching the finest quality tubular tires in Plurien, Brittany, for many years. They’re the first choice for the pro peloton when it comes to cobbles. 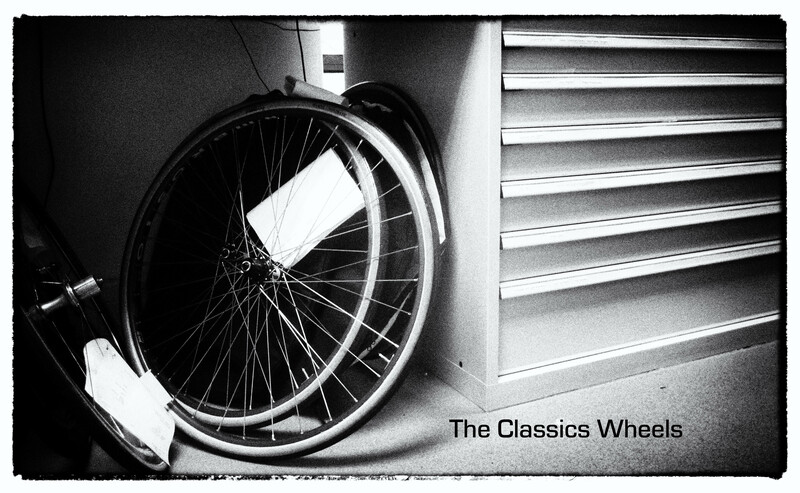 Van Summeren, Cancellara, Boonen, Hushovd; the FMB tubular has been used by all the classics giants whenever Pavé comes into the equation. A pair such as this comes to £1,324 and are the ultimate custom wheelset if you’re looking to attack the cobbles this year. If you fancy giving it a go, La Fuga offer two tours to cater for this very need. Our Tour of Flanders tour offers the perfect combination of riding the course and watching the event the following day, experiencing the electric atmosphere at varying points along the course. Our Paris-Roubaix Challenge weekend runs in parallel and gives you the opportunity to attack the famous parcours of the Hell of the North classic, testing you and your equipment to the limit. Here at La Fuga we pride ourselves on our knowledge of the famous cycling roads of the world, of the stats of the mythical climbs around Europe. But as much time as we spend ‘reccying’ our routes, and preparing our rides, there are occasions when no amount of local knowledge can help. It’s at times like these that we bring in the Garmins. This year Garmin have provided us with several of their GPS navigation tools, for the cars we are blessed with their Live nϋLink! And for the bikes we have the sublime Edge 800, both with full European maps. These help us in a number of different ways from start to finish in the planning, organisation and execution of a successful cycling tour. We travel all over Europe according to their predicted drive times, we look for nearby hotels and restaurants with them on our extra long transfers, we even check guest flight arrival times using the Live mode whilst still in the car. The possibilities are seemingly endless when it comes to logistics and a Garmin, and logistics are perhaps the biggest part of what we do. 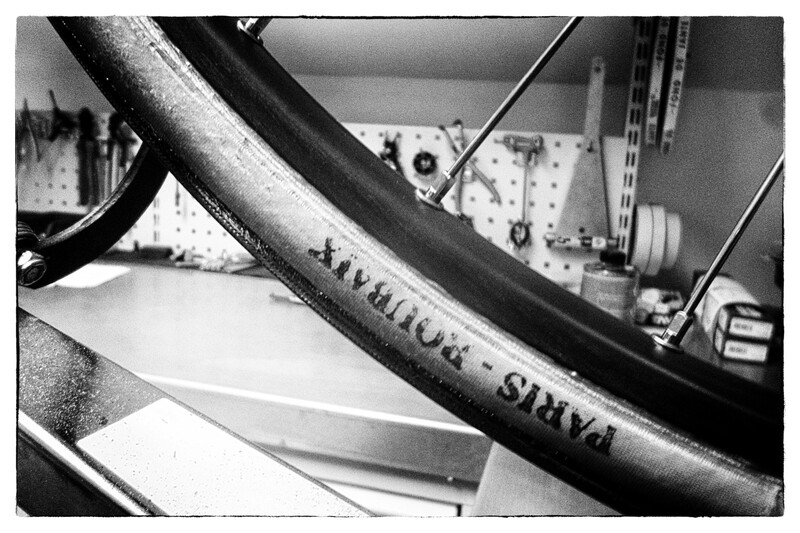 Take one of our Rapha Randonnées for example. These traverse very large swathes of either French or Italian countryside, tackling long epic climbs, but also weaving around the more quaint unknown roads. After deciding on our route we can then take along one of our Garmins and save the trajectory whilst doing the reconnaissance. Once the ‘reccy’ is over we can head back to base, download the files and iron out any mistakes or creases using the very clever mapmyride website. This gives us exact distances as well as stats such as average gradients, total metres of climbing and detailed route profiles. We can then use these to plan simple things such as lunch stops. Looking at the route profile but also by judging the weather and looking at the forecast, we decide on where we should take our midday snack the next day. If the weather is bad we try to aim for somewhere mid climb so our guests are warm when they arrive and warm up quickly when they leave. Once the mapmayride files are ready, we then transfer them onto our Garmin Edge 800’s. These very neat pieces of kit have tactile screens for ease of use and so many settings that I’m still quite a long way from discovering them all. As well as coming with heart rate functions and cadence and speed sensors, the Edge 800s are also compatible with your power meter allowing you to use just one display and keep your handlebars uncluttered. Although we go over each route again and again, having the route there in front of you gives you piece of mind as to where you need to go. The live stats they give are seemingly unlimited. Current gradient, temperature, vertical ascension speed, as well as all the regular ones let you know exactly what you are doing and how long you’ve been doing it for. 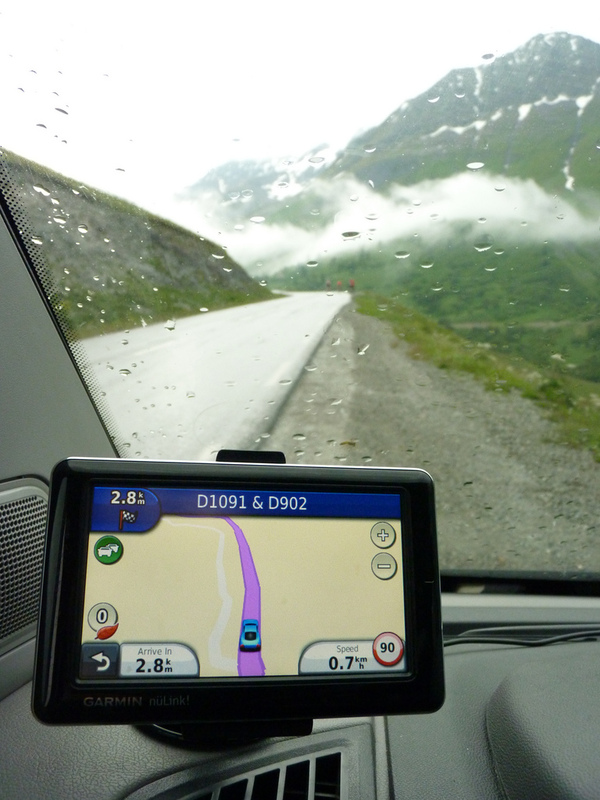 Using the maps on descents is also very useful to warn the guests as to any sharp oncoming corners. A quick look down and a hand signal can make sure nobody comes into a tight hairpin too hot. You know when you are a bit nervous, but at the same time excited, apprehensive but still wanting to go on. Pre-race nerves are something hard to explain, a strange mix of wanting something to start as soon as possible, but also of wanting it to end as quickly as possible. After racing in France for four seasons as an Elite Amateur on the French circuit I had experienced these nerves hundreds of times. In fact, racing week in week out, sometimes several times a week, these nerves start to wear out. Racing becomes more of something you have to do rather than something you want to do. This only began to happen on a bad run of form when you were tired. When you had some legs the nerves were always back in force. And on this particular day, I had legs. 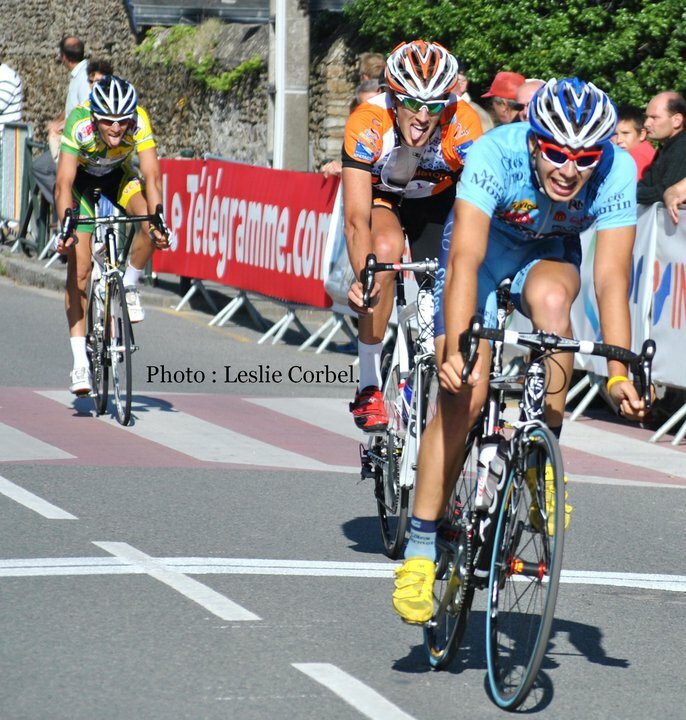 The race was 140km around the coastal area of the south of the Brittany region in the North-West of France. The Tour du Rhuys is pretty much pan flat and winds around in several directions. Tracing the coast before turning back on itself several times, the race finishes on a short but sharp finishing circuit in town. I had done it once the year before, but then I was in a state of fatigue after a long hard season my legs weren’t in any state to respond. This time I had come off the back of a serious knee injury early in the year and was just coming into some form. All I needed now was a number on my back and some roads to pummel. The warmth of the day made pinning on my ‘dossards’ a pleasant job, something occasionally marred by bad weather that makes you wonder if you should just hand the numbers back and go home. I performed all the pre-race checks and rituals, shorts at the right height, socks at the correct length, tyres pumped up to the right pressure, quick release skewers tight enough, brakes nicely centred. Race time. I lined up at the back of the bunch, confident I could quickly move up. Other races I wouldn’t be so confident, many a time I got on the front row in a fast criterium so I didn’t have to destroy myself to get to the front. We rolled away quite steadily knowing we had a good way to go, but the attacks soon started to come. I got to the front end of the race and followed a few moves to open my legs and lungs up. I knew I was feeling good right from the gun. Now I just needed to use it properly. After sliding into the first real move of the day I pressed on the pedals and started to make myself hurt a little. I knew that if I was hurting then others around me would be in trouble. Our group was brought back but I countered straight away with 4 others and we quickly got a gap. I knew two of the guys with me were strong but after using the other two up, they quickly dropped away. I was on fire. My legs did everything I wanted them to and more. The problem is that when I reach this level of form, I ride like a complete idiot. I do far too much work trying to show off and forget that riding intelligently is as, if not more important, as having the legs. The three of us forged on, holding between forty seconds and a minute over the chasing pack. Our time checks were given on a chalk board and each change in the gap was either helpful or disheartening. We started to get different splits at once, the bunch had split up, and three riders were coming across to us. They slowly made inroads on our gap and eventually we could see them behind us. It didn’t surprise me to see the three major race favourites turning the pedals and it signalled good news and bad news. The good news was that the race had been decided and as long as we worked well together one of us would win. The bad news was that now I had 5 of the most in-form riders in the region to beat if I wanted to win. The good news was confirmed as we quickly settled into rhythm based on some of the unwritten rules of cycling. I would try and explain these rules but it would take at least three separate blog posts. As we pressed on my legs started to hint at the first signs of fatigue, hills began to feel a bit longer as the lactic acid made its way round the cells, but I still felt good. We hit the finishing circuit and the dung hit the fan. The first attacks came from one of the guys and our group split and came back together before splitting again. Although we weren’t working together we knew we were chasing the win so the speed never dropped and I started to feel the burn. I followed attack after attack and even dared to make my own once or twice. It’s at this point that your brain starts to go fuzzy with the details as your effort levels exceed your thought levels. Eventually the group split with less than a lap to go, and I wasn’t in front. I wouldn’t be gunning for the win and I was disappointed. After a quick sprint I came in 5th. As per usual I had done too much work, everyone loved to tell me as much afterwards as well. I was cursing at myself at the car, when I heard my name over the loudspeaker from the podium. For some reason they wanted me to go there, probably so they could mock me for my race tactics. Fortunately I had won the prize for the most aggressive rider; unfortunately this prize came in the shape of a tree, or at least a large shrubbery. Not something I had been hoping to win, but I appreciated it all the same. It was too big for me to take it home so I had to give it away. Another race raced, another race lost…onto the next one.